We are preparing for a visit to Peru next month. During this trip we will be traveling to the interior and visiting the heartland of the old Inca civilization, including the ancient city of Cusco. We are looking forward to this visit. I have been doing some reading in anticipation of this trip. The first book that I read was ‘Turn Right at Machu Pichu”, by Mark Adams. This book, first published in 2011, weaves two different story lines. The first is Mark’s experience of traveling the region, following in the paths of earlier explorers, including trekking the famous Inca Trail to Machu Picchu. Mark interweaves this narrative with an account of the history of the region, some of it very brutal, mostly centered around the time of the Spanish conquests of the area. He talks about the “discovery” of Machu Picchu by Hiram Bingham III, a somewhat self-serving American explorer in search of fame, in 1911. But Machu Picchu was never really “lost”, especially to the people who are from the region! In any case, the stories are interesting, even if the details of the book are difficult to remember just a few weeks after reading it. My memory is not what it used to be. The other book I read more recently was “The Old Patagonian Express”, by Paul Theroux. This book was first published in 1979. It is an account of Paul’s travel from Boston, Massachusetts, to Esquel in Patagonia, mostly by train. The travels took the author through Peru, and specifically Cusco and Machu Picchu. I have a copy of the book that I had bought in June of 1985, when I was about to graduate with my doctorate degree. It was time to open the book once again. The spirit of the somewhat arduous trip taken by Paul Theroux (it took a few months to complete) is something that I can appreciate. It is an undertaking that seems to have been driven mainly by the author’s sense of curiosity and adventure, and his need to leave his zone of comfort in the process. It is about the thrill and the romance of travel. You do it because you want to see, experience, and learn about new things, new places, new people, etc.. You are not looking for the familiar place or face. You do not have a complete plan in place to handle the situations that you will encounter. And it is more significant than that – you willingly open yourself to the unexpected and let yourself become more vulnerable. And in all of this, you manage to learn something more about yourself. One has to remember that Paul Theroux’s book was written in the 1970s. I now find that his attitude towards the kind of people that he encountered, especially the locals, seems to be somewhat condescending, or maybe it is just a general sense of superiority. I wonder if it is actually a sign of the times that Paul Theroux lived and traveled in, or if it is a somewhat generic attitude taken by folks who are out on voyages of discovery, including most of the explorers of times past – especially those from Europe and North America. They always thought that they were better off than the others, and that they knew what was good for others. Perhaps they were really better off from a materialistic point of view, but did they necessarily know what was good for others? Paul talks a lot about the poverty he encountered in Peru, especially among the natives. The power structures in place in government in those days did not seem to be geared towards improving the lives of the common man. Perhaps it is all true. My problem, reading Paul’s work at this time in my life, is the feeling I have that he does not seem to have gone beyond the superficial in trying to understand the lives of people. He does not seem to have had the conversations that someone who is undertaking this kind of effort should be having. Maybe he did not have enough time. Maybe he did not think his book was meant to be read by somebody of Inca ancestry. In my mind, he comes off as being quite opinionated in this regard. He might have thought that he was be brutally honest, but I think the problem is that he did not make the attempt to have a more complete perspective. He really did not complete his homework. Perhaps, this is a general problem with the attitudes of too many explorers. Anyway, here we are, more than 40 years after the time of Paul Theroux’s travels to South America, and we are on our way to South America once again (we went to Ecuador two years ago). I wonder how the country of Peru has changed since the 1970s. We are not adventurers like Paul Theroux. We are going in an organized tour group, and everything is going to be taken care of for us. We will probably be shielded in some way from the locals. Paul Theroux had also traveled through Ecuador, and he talks about the poverty in that country, but our exposure to those circumstances a couple of years ago in the tour group in Ecuador was minimal. It could be that the situation has changed since the 1970s, but it could also be that we were just shown what would be tolerated by “tourists” like us – things that were unlikely to cause us distress, or show the country in a poor light. It seems like the town of Cusco was geared somewhat towards tourism even in the 1970s. It is in all likelihood even more so today. You only have to see all the information on the Internet in this regard to sense that this is the case. You would also be led to believe that people are generally much better off in Cusco today than 40 years ago, but how can one be sure without having the complete experience? As I said before, since we will be arriving in Peru as tourists in a tour group, almost everything that we do will be according to a plan and a schedule. But the explorer in me feels that perhaps some of the more remarkable and memorable moments of the trip could happen outside of the script. One just has to be open to the possibilities. One final note about the trains that Paul Theroux took many years ago. Even in those days, there was no way to do the entire trip from Massachusetts to Patagonia solely by train. Looking at the available train services today, this situation has gotten even worse. Passenger train services are available in much fewer places today. Common folk have to depend more on the buses than they used to do in times past. In a few places, the trains have been saved by running services over short distances just for the tourists. But this is not the real thing! The romance of the railroad is not what it used to be. It is snowing outside as I begin this blog. It is hard to imagine that just a few days ago I was in Chennai in India where the temperature was around 80 degrees Fahrenheit! I never really completely adjusted to the change in time zones during this trip to India. I was up well before the morning hours almost every day during my three weeks there. I did not let this strange affliction bother me. I found something or the other to do – spending time on the computer, or reading a book, or doing something else that did not require me to get out of bed and disturb everybody else. This trip was a little different from my past visits. I actually had time to relax at home, even keeping visits with friends to a minimum towards the later part of the stay. But the trip was also exhausting, and also a little emotional in some sense, since I made the visit to Kerala, the state where I was born, the place where our family is originally from. I have blogged in the past about the nostalgia associated with traveling to Kerala as a child, and also writen more recently about how my love of the mountains may have blossomed with one such trip. The quick trip I made to Kerala this time was different from the journeys of my youth, when I used to stay there for the long summer holidays, but it was also about being taken back to the days of my youth. I was going to visit relatives who lived there whom I had not seen for many years. For starters, because I did not have time to do so, I did not go to Kerala by train. 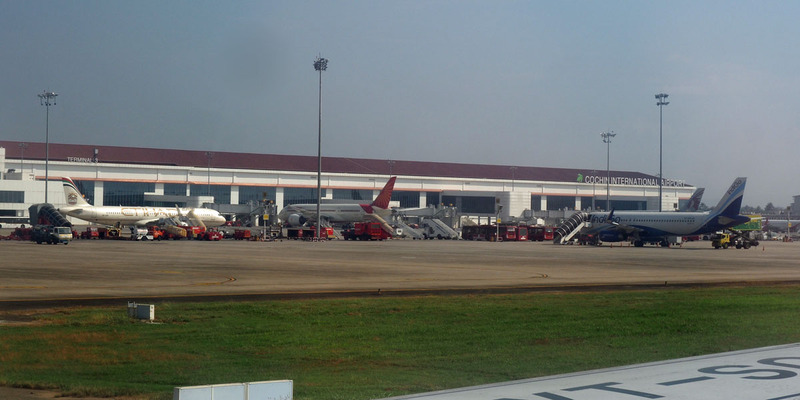 Instead, I flew into Kochi airport. My first stop was to see an aunt and uncle in Aluva whom I had last visited about 12 years ago. Life has changed for them since then in ways both happy and sad. The joy of the growing grandchildren in the family has been balanced by the impact of a devastating accident a few years ago that has changed their lives in a dramatic fashion. After some conversation and lunch, I took the opportunity to go down to the Periyar river that flows next to their property. They had been forced to evacuate their apartment just a few months earlier because of flooding of the river. A long taxi ride in the evening got me to my next stop in Irinjalakuda to see my cousin – whom I had also not seen for a long time. Along the way, it was interesting to see that they still paint the state’s public transport buses the same way they did as when I was a kid. I have very little recollection of having visited my cousin’s home (which was built in the 1980s) before, even though we have met a few times since then. Most likely, I have never been to this house. The emotions welled up in me as I talked to my cousin about the days of her youth and her connection with my parents when they were young and had just got married. (My cousin is significantly older than I am.) I felt a sense of the passage of time, and a sense of how lives lived in the past lead into the future. This was one of the nights that I woke up earlier than usual in the morning and lay in bed unable to sleep – this time simply thinking about the connections of the lifetimes. I was somewhat of a wreck by the time day broke, but I did take the time to go out and take a picture or two after recovering my composure. The bonus of my stay in Irinjalakuda was the opportunity to meet a high-school classmate whom I had not seen for 43 years! I got to go to his home and also meet his wife. It is interesting to to see how how circumstances in life can take you in very different directions, and to many different places, but that you can end up in the end at similar places of peace and happiness. You can define success or failure in your way without allowing others to define it for you. Then it was off to the railway station to catch a train to Palakkad. The train journey was an interesting experience, but I must move on without talking too much about it, since this blog is already getting longer than I would like it to be. The only thing I will note is that my experience of the train journey left me feeling that I was still in the 1970s! The train journey was to take me to Dhoni, near the Palakkad railway station, where I was going to visit another aunt of mine. I had not seen her for decades. We have a little bit of a language barrier since I do not know the mother tongue well, but I need not have worried. That did not stop our conversation. My aunt has gone through the struggles of time since I last met her, having had a somewhat painful physical setback. She manages. She now cheerfully oversees the larger family, including her own children’s families, who have already set up, or are in the process of setting up, their own roots all around her. During this visit she insisted that I needed to eat well (more than I am used to eating), to taste all the foods from my youth. It was a treat! Dhoni lies in the shadow of the Western Ghats. I set out to explore the place at sunrise. The village’s charm has not changed over the years. While the population of Dhoni might have increased since the old days (there are more houses, and even a management college started by one of my cousins), it is still not crowded, at least in my eyes. The roads are broad and also empty the time of morning that I was out. The waking hours reveals the feel of the village, the only distraction being that of the trucks from the local rock quarry that kick up a dust and do not slow down as they speed down the road. The family house in Dhoni begins to catch the light of the rising sun in the morning. The mountain of my youth (or maybe I should call it a hill) still remains, still looking a little formidable to the young child who has now become an older man. I am not sure if the hill is as accessible as before. New property lines lie between me and the peak that I can barely make out in the early morning light. There was no marked trail for me to follow, although my cousin might have known a way had he been able to accompany me. Habitation on the road that used go past my aunt’s place has extended towards the mountains these days. There is a bus service, and I saw a couple of hotels when I looked on the map. Kids climb into the back of the auto rickshaw to go to school in the morning, while the dog runs freely on the street, and the roadside tea shop is open for business early. There are farms that did not exist a few decades ago. A couple of peacocks fly away from the field when I point my camera at them. Somewhere, a cow grazes surrounded by egrets – probably cattle egrets. I did also visit my cousins’ farms closer to the mountains. 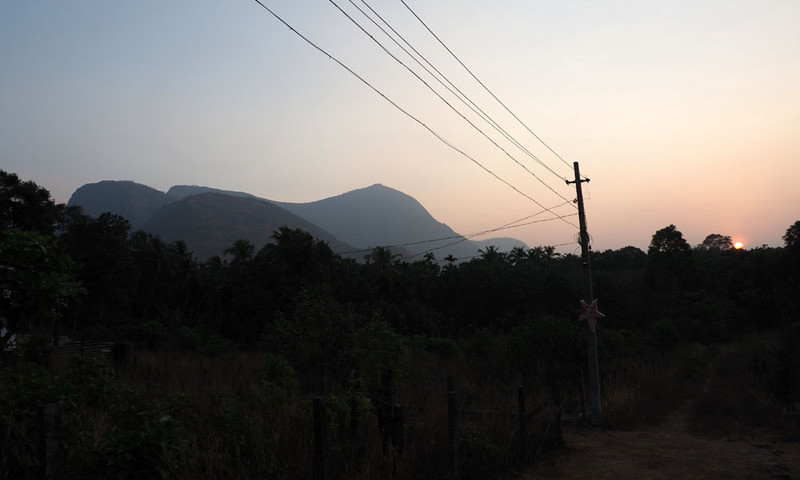 You could see the Western Ghats in the distance as we walked past an open field, just before the entrance to the farms. I am told that elephants have come to roam this space these days, and there is an electric fence around the fields for protection. One of my cousins takes care of all the properties and grows fruits and vegetables on them. He tells me the story of having been given seeds for what he was told was cabbage, and finding out that he now has tons of lettuce growing on the property! That is the way it goes. Life still seems to have a certain simplicity to it. I could get used to it. I wish I had learnt to speak the language better as a youth. There is a certain sense of loss. I had to leave Dhoni even before noontime to catch a flight from Coimbatore (across the border in the state of Tamilnadu) to Chennai – but not before my aunt plied me with more food. The short, intense, and tiring, trip was coming to an end. Back in Chennai I went to bed early, and then slept like a rock, waking up a little later than usual. And then, less than a week later, I was sitting in my room in Gaithersburg in Maryland watching the snow falling. It is quite the change. Life can be that way, I suppose! This vegetable shop is also a new sight on the street in front of our house in Chennai. They seem to be doing a tremendous amount of business. I have noticed crowds at all times of the day. While their bright lighting serves them well when it comes to advertising their presence and their goods, it can be a nuisance just across the road in the nighttime because they are open till somewhat late in the evening. And the fact that some of their customers park their vehicles in front of the gate to our house is also a major annoyance. All of that having been said, this storefront seems to be a step up from the kind of establishments that have tended to come up in front of our house in the past. Things are constantly changing here in Madipakkam, a suburb on the outskirts of Chennai. This is in front of our house. The cafe is relatively new. There was a Malaysian parotta place here during my previous visit. They seem to be doing a reasonable amount of business. The concept of staying on your side of the road will get you nowhere when you are trying to get someplace. And if you are on a two-wheeler, you may even try to maneuver sideways between two vehicles if there is enough space to find your way around stopped traffic. The pedestrian is a forgotten entity in the midst of all of this, but, because of the nature of the place, people have to cross the road all the time to take care of daily business. These folks are looking for the break in the traffic to start walking across the street, hoping that no other vehicle appears on the road while they are in the process. If one such vehicle were to appear, it is more than likely not going to stop for you. Rather, the driver, in all likelihood, is going to try to find a way around you, trying to avoid slowing down. This will happen even while you keep moving. It is not clear what one is supposed to do. Do you keep walking, do you halt in your tracks, or do you make a dash for it, not knowing how the speeding vehicle will respond. You take your life in your own hands. I have seen people put out their hands while stepping in front of a slowly moving vehicle like a bus, instructing it to stop. That seems to work. After all, bus drivers probably do not wish to be lynched by an angry mob if something untoward happens. I once had to wait about 15 minutes to try to cross a busy road. My friend, who was waiting patiently in a car on the other side, finally stepped out on to the road, put his hand out, and proceeded to cross over to my side. It was the work of a master of the craft. My initial experience with trying to cross the road in front of our house during this trip nearly led to disaster. I had lost all the skills I thought I had acquired from previous visits. I was probably fortunate to not get injured. But I am getting better. What is required is a ton of patience. And sudden moves to make a dash for it across the road are ill-advised. Also, never try your luck crossing the street when your vision is partially blocked, especially by a bus or some similar sized vehicle. Folks who live in these parts have been crossing busy Chennai roads like this for years. They are taking a calculated risk when they do this, and probably feel that the chances of not being hit under the circumstances are somewhat reasonable from a statistical perspective. People have no other choice, and you have to have a certain sense of fatalism ingrained in you if you are to survive under these circumstances. I could not resist posting the picture below. The family is on a two-wheeler, probably waiting for mom to reappear from her shopping at the local store. She will get on the back of the motor-bike, behind dad, and off they will go! It happened when we were in Kanab, UT. It had been a while since we had gone to a Chinese Restaurant. Luo’s Cafe was close enough to the hotel for us to walk to. The food, and especially the hot soup, was welcome on a cold evening after the active day in Zion National Park. We got fortune cookies at the end of dinner. The one I opened up said “In the near future, you will discover how fortunate you are.” I have thought of myself as very fortunate for many years of my life. So this message about making a “discovery” was incorrect in a way, but considering the nature of the trip that we were making, it was still interesting, and perhaps timely, anyway. The other fortune cookie had the message “It is better to have beans and bacon in peace than cakes and ale in fear.” Please contact me if you can figure that one one out! Here are some stats from the trip. According to the odometer in the car, we covered 2579 miles during this trip. This might be equivalent to driving across the country. The places we stayed in were Denver, Estes Park, and Parachute, in Colorado; Moab and Monticello in Utah; then Monument Valley and Page in Arizona; back to Kanab, Cannonville and Torrey in Utah; and finally Red Cliff and Denver in Colorado. The National Parks we visited were Rocky Mountain, Arches, Canyonland (two different sections), Mesa Verde, Northern Rim of the Grand Canyon, Zion, Bryce and Capitol Reef. Places visited also included Monument Valley, Pike’s Peak, Four Corners, and a few state parks. We passed through numerous interesting little towns, including places like Escalante in Utah, and Parachute, Red Cliff, and Leadville in Colorado. We did drive through a town called “No Name”, and drove past a restaurant called the “Bla, Bla, Blah Cafe” towards the end of the trip. Most of the travel was on the Colorado Plateau. We started off at an elevation of slightly over 5400 feet, in Denver, and probably stayed at an altitude above that most of the time, finally hitting over 14,100 feet at Pikes Peak. The weather cooperated for the most part. Even when it rained in the night or in the morning, it would clear out in time so that we could do something outside. We had some really cold mornings, even around 20 degrees Fahrenheit, but it usually warmed up enough for us to get going. We always dressed in layers, and the outerwear would go into the backpack as we warmed up during a walk. The snow that we experienced was not significant enough to cause problems, but it did bring an additional element of beauty to our travels. One of the surprises for me was the fact there are still cowboys in the west, and that cattle still roam the open range in Utah. There is definitely still a western culture. Another delightful surprise was the discovery of the town of Red Cliff in Colorado. I could have spent more time in that area, including a drive through Shrine Pass. I could probably have also spent some more time at places like Cortez, Escalante and Leadville. But we had other places to get to. People we encountered were generally nice and helpful. Conversations were not very deep. Politics never came up and that helped us stay out of trouble. The servers at the restaurants were mostly genuine and hardworking, and we ended up talking to some of them, and even tipping more than usual. There were many tourists from Europe. I noticed very few black families in the parks. This is unfortunate. On the other hand, the number of oriental tourists we encountered was staggering. For a reason I cannot fathom, tourists from India are found in large numbers in Page, AZ. It took me a significant amount of organizing effort to make sure that we had a place to stay every night of the trip, and that these places would be suitably located relative to things that I thought were good to experience. There was no issue with any of the hotel reservations, and some of the facilities had their own character and were interesting in themselves. There might be one or two changes that I would make if I had to do this again, mainly related to location, but things worked out nicely for the most part. I had also created a list of things that sounded interesting to see and do for every place that we stayed at. I did all the driving, but Teresa worked out all the details of packing and unpacking and managing the stuff that we carried during our hikes. My outerwear to handle cold weather stayed in the back seat of the car for the most part when I was not wearing it. I spent significant amount of time every evening, and the next morning, working on the blog for the day. I used to wake up very early in the morning and slept less than usual overall. It must have been the difference in time zones that I never adjusted to. But I have also noticed that something like this happens to me every time I make a trip like this. We jointly decided what we would try to see and do on a particular day, and it mostly worked out. We were flexible in planning and adjusting when things did not go exactly as planned, especially when it rained. Sometimes the advance planning was minimal. We did not see everything we would have liked to. There was not enough time. We did most things together – there were a couple of occasions when I did a little extra on the trails. We managed to not get on each other’s nerves too much. It was good teamwork. Teresa actually started proof-reading my blogs after the first few days. I know it helped, but I suspect that a bunch of editorial stuff still needs to be addressed. I will try to fix errors as I find them. The return to Gaithersburg and reality was smooth but I would not call it pleasant. The election season is upon us, and it is the season of lying and spreading fear. But a day at the Manna food bank revived my spirit somewhat. I did manage to rescue the jacket that I had left at the security checkpoint on our way out of Dulles Airport on the 6th. Some people may not be happy about that, hoping that this rather tattered piece of clothing would disappear. But I think there is something to be said about being sentimental about old things. Here is the link to a page that lets you access all the blogs for the trip in the correct order. By the way, this is an amazingly beautiful country!